Ms. Angela Black attended the University of Tennessee in Knoxville, Tennnessee. She received a B.S. in Special Education. 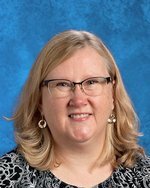 She is certified to teach ELA grades 7-12. Ms. Angela Black has past experience teaching CHS Behavior Modification. Previously, she worked at Annapolis Area Christian School as an Educational Therapist. She also worked at Arnold (MD) Christian Academy as a Kindergarten Teacher, grades 5-8 ELA Teacher, and an Educational Therapist.